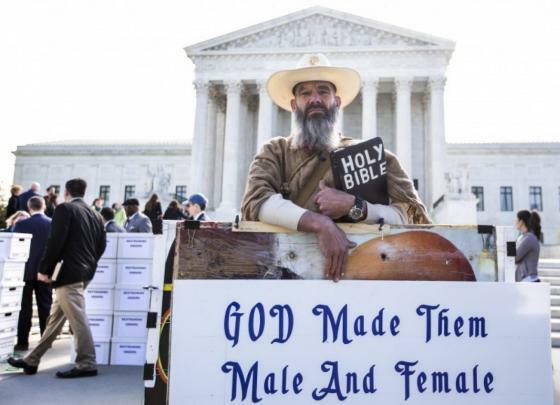 That guy is Alan Hoyle of North Carolina protesting in front of the Supreme Court. To his right are Janet Porter's boxes of stuff that people paid to get mailed. Apparently Porter kept their money. 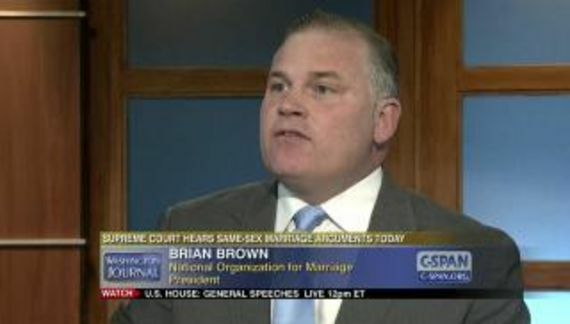 Tuesday, National Organization for Marriage wants us to know that their marriage pledge is a presidential litmus test. To demonstrate their political muscle, NOM quotes liberally from a piece that appeared in the Washington Post as part of their daily political rundown. As the article notes, every major Republican candidate in 2012 signed NOM’s presidential pledge, including nominee Mitt Romney. NOM expects the Presidential Marriage Pledge to play a significant role in ensuring that marriage is a top-tier issue in the campaign, and will work to ensure that the Republican nominee is a strong marriage champion. Selective observation marries abject denial. At its core NOM's pledge requires the support of a constitutional amendment that could never be ratified. Who wants to back an obviously doomed enterprise?